I could hear the balls hit our basketball hoop and then the ground. I couldn't see them from my kitchen table a few feet away, because I'd taped temporary paper shades on the glass in the door and over all the windows. One by one, my new friends-- friends who had each had a son die-- turned the handle and came inside. They'd parked in the crowded driveway we shared with our neighbors, dodged the basketballs in our carport, and come to our grief support group. "I don't know how you do it!" they each said to me. This was a phrase they'd likely heard themselves many times. How did they make it through multiple rounds of chemo with their precious boys? How did they tell their sons they weren't going back to school? How did one go into her son's bedroom to wake him, but find him dead? They knew they were not made of stronger stuff than other moms. They'd just been thrust into unwelcome, nearly untenable situations that they couldn't run away from. They knew that grieving moms are just people doing the best we can. But that night they said it to me, quickly piecing together that the boys playing outside my door were the ones who were with Jack when he had his accident. While I'd never experienced hospitals, blood draws, invasive tests, toxic treatments, and having Jack lose his beautiful hair, I was experiencing something excruciating as I saw Jack's best friend, and his new best friend, bond and live and play right in front of me, day in and day out. The stark contrast between these living children and my dead son was almost too much to take, and these mothers' hearts recognized that in an instant. I talked about this with my pastor and friend, Glenda. I felt terrible for feeling angry and uncharitable toward children-- so jealous and petty. My magical thinking would have one of them die, while Jack would live. This was so far from how I wanted to be-- Anna The Super Griever who spread her love and warmth like fairy dust-- but it was real, and raw, and exactly where I was. There would be no warm and fuzzy tv special about how I'd taken the boys in as my own, cultivating a surrogate mom role to make up for losing Jack. Nope. So, I piled guilt on top of my anger and grief. But I wanted to feel my pain and anger and not cover it up by pretending like everything was okay--faking kindness and compassion that wasn't yet there. Grieving Jack felt too holy for anything other than truth and light and 100% honesty. After hearing all of this, Glenda touched my hand and rubbed it gently. She said, "If your hand is raw and in pain, there is nothing wrong with finding a balm to soothe it. To coat and protect it as it heals. That's not weakness. You don't need to feel guilty. That's just taking care of yourself." I honestly couldn't think of one thing that could be a balm in the colossal missing and longing for Jack. 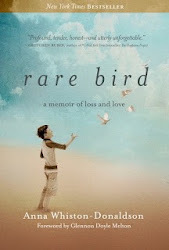 But as those early days turned into months, and then into almost 2 years, a balm came into view. I was healing, I could tell, but the pain of seeing the two boys multiple times a day continued to be incredibly painful. I made the difficult decision to move our family to a new house, even if it meant dragging Tim and Margaret along with me. It was not a savvy financial decision. It was very hard on Margaret as it represented her leaving her childhood behind. It meant driving over the creek where Jack was found multiple times a day. It meant leaving Jack's room behind. But it was a balm. Of course I still felt grief and pain while I healed, but that rawness, that fresh pain anew every single day, was coated by a bit of distance, just as ointment buffers and protects a wound. This month it will be 5 years since we moved. Our windows are bare and the light streams in. I was not a bad griever, or a bad person, for recognizing my need and doing something about it. For letting myself off the hook of being the comforter for everyone else, including my neighbors. If you are hurting right now, feeling the sting of loss and disappointment or dreams unrealized, perhaps you, too, could find a balm. Something unexpected and sweet that doesn't numb you from your experience, but gives you a bit of a buffer of protection. Is your balm to decline from going to baby showers or weddings? Is it to walk away from a friendship that causes you nothing but pain? Is it to log off social media for a good long while? I don't know, but I send you love as you consider it. As you know, I've had a bunch of t-shirt ideas bumping around in my head. I created a few awesome shirts to sell on Amazon, and while the shirts are gorgeous, I've been less than thrilled with my ability to communicate with the company when the need has arisen. So when I got a new t-shirt idea, this one VERY CLOSE TO MY HEART, I decided to look into alternatives. I chose to use a fantastic company, Custom Ink, and it has been the perfect fit. My friends and I have used Custom Ink for years to design cool shirts for sports teams, family reunions, and concerts, and it has been a 100% awesome experience. I remember last year when we were on a time crunch to get Margaret's field hockey T's ready for Senior Night, and a real live person at Custom Ink made sure they arrived with a few days to spare. But what I didn't know was that Custom Ink also has a fundraising platform! 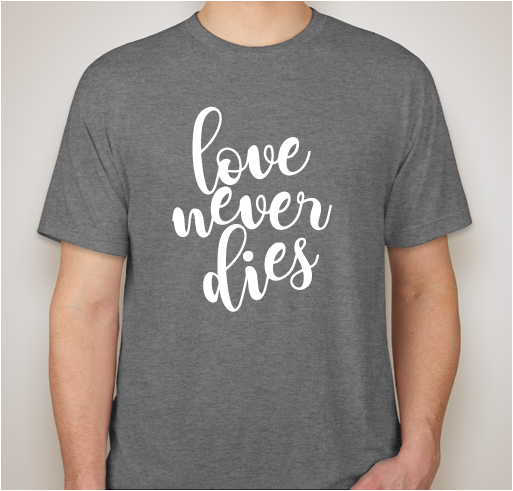 I could design a t-shirt (or have Custom Ink's artists do it for me) and have people purchase it online as a way to raise funds for a cause I believe in. I wouldn't have to worry about inventory or shipping either, because Custom Ink would take care of all of that for me. Thank goodness. 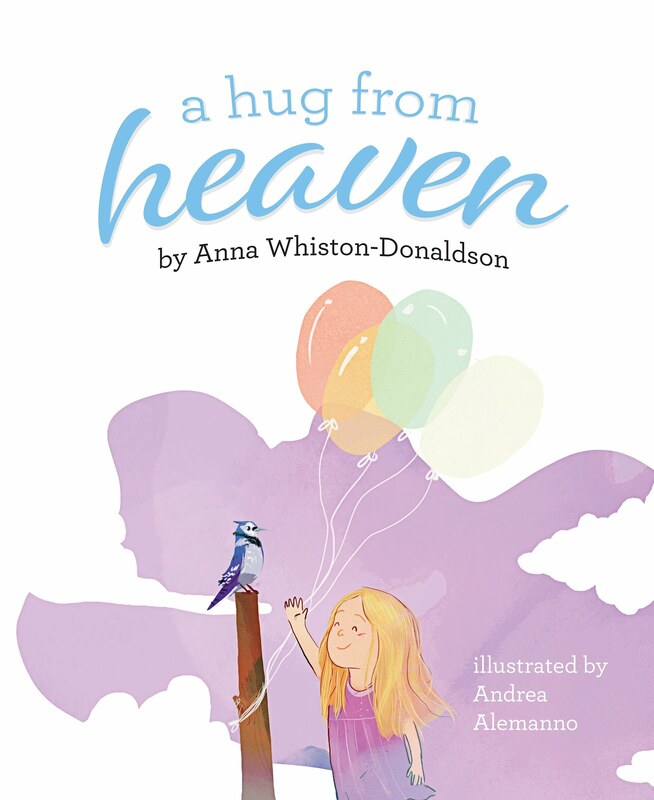 In honor of my children's book about grief coming out this fall (A Hug from Heaven), I knew I wanted to raise money to help grieving kids. I chose Comfort Zone Camp as the recipient of any profit these shirts make. Comfort Zone was a safe place of healing and growth for Margaret and our whole family after Jack died, and being with other grieving kids helped Margaret feel less strange and alone. There are so many grieving kids who need our support. Did you know that one in five kids experience the death of a close loved one before age 18? 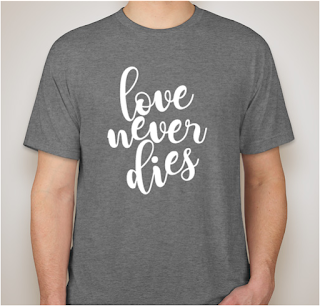 Many, many of my readers have experienced the death of a loved one, and I hope this simple t-shirt speaks right to your heart the way it does to me. Love Never Dies. 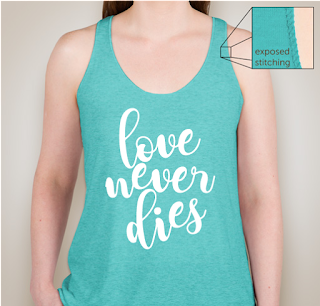 It comes in a variety of colors and styles, including kids' sizes, and is super soft and comfy. If you decide to purchase it for yourself, or for someone else, may it be an encouragement to you that death ends a life but not a relationship. 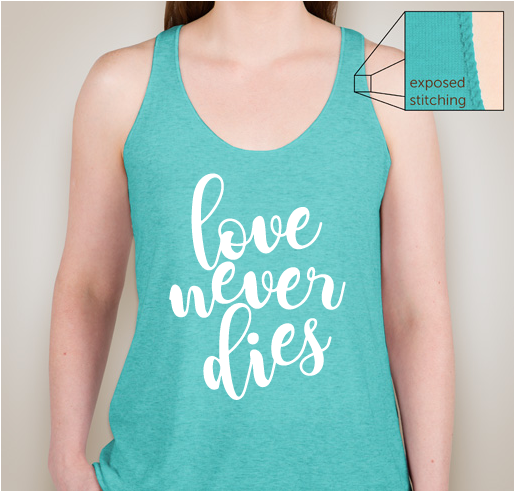 Your purchase will help spread hope to the kids aged 7-17 who attend Comfort Zone Camps each year. Thank you for your support of this campaign! And if you are looking for an easy and enjoyable way to spread your message and raise funds for an important cause in your life, check out Custom Ink. They made this process a breeze. This post is sponsored by Custom Ink. Thank you!